• CS/C-mount, 640 x 480 square pixels. • Dual firewire ports for daisy chain connectivity. • Frame rates: 86 fps (Format-7 mode 0), 60, 30, 15, 7.5, 3.75. • 8 bit or 12 bit color RAW or YUV-422, synchronization by 1394 bus. • Gain Control: 0 ~ 18 dB / S/N ratio: 56 db or better. • Shutter Speed: 1 usec – 3600 sec. • Size: 81 x 47 mm, height 21 mm (with C/CS mount adapter). 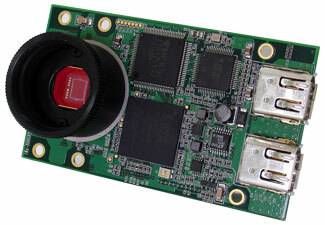 • One Fire-i VGAc board OEM camera. • Fire-i™ application and drivers. • Unibrain Fire-i API™ software development kit license.